When the Evil Dead remake was released in 2013, producer and director of the original upon which it was based Sam Raimi claimed that not only was Evil Dead 2 being planned, but so was Army of Darkness 2, which he would direct himself, with the hope of someday bringing Ash and Mia together in an epic showdown. We haven't heard much in the year and a half since that talk started, but today at Comic-Con, Sam Raimi revealed that he and his brother Ted Raimi are moving forward with an Evil Dead TV show. Sam Raimi made the announcement while promoting the upcoming video game adaptation The Last of Us during a Screen Gems panel. 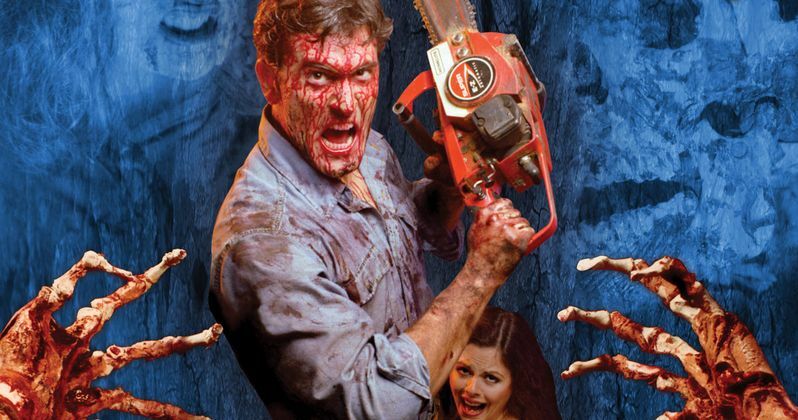 Bruce Campbell will definitely be involved in the TV series, but it was not said if he'd be reprising his iconic Ash character, or if he might serve a sort of Crypt Keeper host, which has been speculated, or if he is simply aboard the project as an executive producer, as he was with the recent Evil Dead remake. Nothing else is known about the series, and there is no telling where the story could go, or how this could play out. Sam Raimi has teased fans before with news of a new adventure for Ash. As true fans of the director, we must remember that it may be many Comic-Con moons before this thing actually becomes a reality.